See also the new pages of the Wailing Wall in the 1800s and the transformation from the Wailing Wall to the Western Wall in the 1960s. 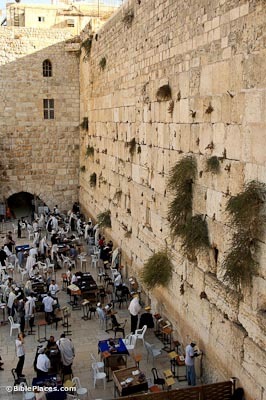 The Western Wall is the most holy place accessible to the Jewish people because of Muslim control of the Temple Mount. Known in recent centuries as the “Wailing Wall,” this was built by Herod the Great as the retaining wall of the Temple Mount complex. 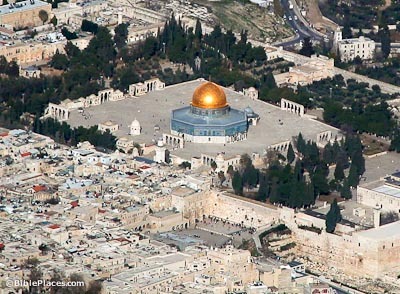 The plaza was created as an area for prayer when Israel captured the Old City in 1967. At times tens of thousands of people gather here for prayer. The massive lintel of this gate is preserved to the right of the bush and above the small fillstones behind the staircase. Once erroneously identified with Kipunus’ Gate (mentioned in the Mishnah), today it is known for the 19th century explorer who discovered it. The original L-shaped passageway inside the gate is still preserved but not accessible. 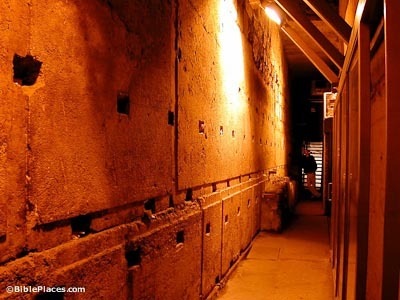 The most holy place in the world accessible to Jewish people, prayers are offered up at this wall built by King Herod in the first century BC. Three times a day the Jewish people pray (morning, afternoon, evening) and they do so with phylacteries tied around their forehead and wrist and with the white and blue prayer shawls. The men’s prayer area continues from the outdoor section through a passageway to the north. Within this area is a massive arch originally constructed by Herod and now known after a British explorer in the 1860s. Though only 25 feet high now, the arch originally was 75 feet high when the Central Valley was much deeper. An especially large course of stones is visible on the southern and western walls today. On the west the “Master Course” consists of four stones, the largest of which weighs 570 tons and is 44 feet long, 10 feet high and 12-16 feet deep. The next largest stone in the wall is a mere 40 feet long. The largest stone in the Great Pyramid weighs 11 tons. The “Wailing Wall” in the 1800s (LifeintheHolyLand.com) A collection of drawings and photographs from the 19th century illustrating the Western Wall, along with explanatory notes by early explorers including Charles Wilson. Wailing Wall to Western Wall – 1960s (LifeintheHolyLand.com) A collection of photographs of Charles Lee Feinberg with explanatory comments revealing a critical decade in the history of the holy place. 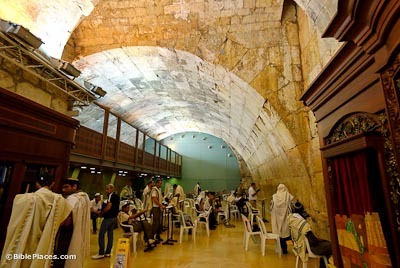 Aish HaTorah’s Tunnel Tour (aish.com) An extensive virtual tour of the Western Wall tunnels. Includes pages about the “Secret Passage,” Wilson’s Arch, Warren’s Gate, Holy of Holies, Struthion Pool, and more. Jerusalem – The Western Wall and its Tunnels (Israel MFA) Gives the background of the Temple Mount, highlighting the Western Wall, both the section visible from the plaza and the length located in the adjoining tunnel. Copy of this page at Jewish Virtual Library. The Western Wall (The Israeli Mosaic) Contains informative sections on the wall itself, Jewish tradition and the wall, recent history, and getting there. Links throughout allow for in-depth study. 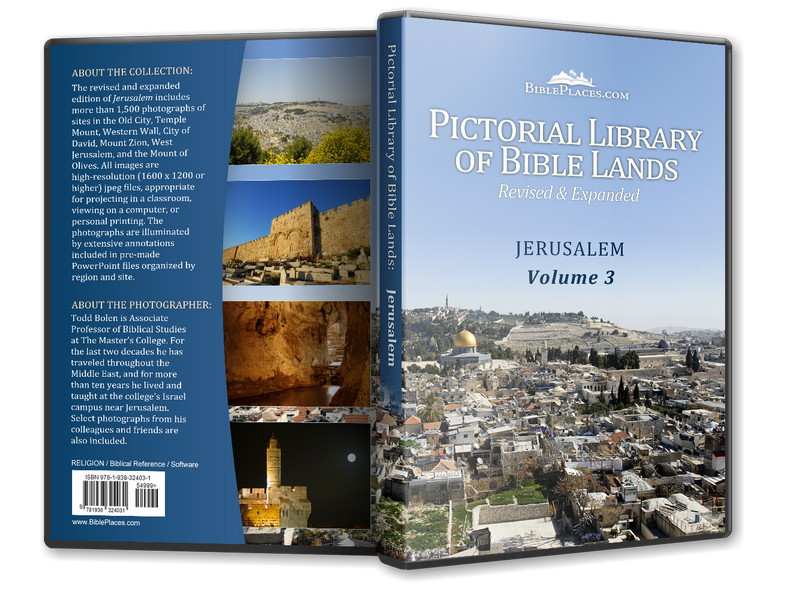 Western Wall (Christian Travel Study Program) Limited text, but site features several good pictures with excellent identifying captions. Kotel Ham’aravi (Camp S’dei Chemed International) Describes both the history and significance of the wall from a distinctly Jewish perspective. Western or Wailing Wall? (Jewish Virtual Library) Discusses the history of the wall’s name over the centuries. Live Kotel Cam Features a live camera view of the Western Wall. Also includes a virtual tour of the tunnels. Window on the Western Wall (aish.com) Includes another live camera view of the Western Wall, as well as other related links. 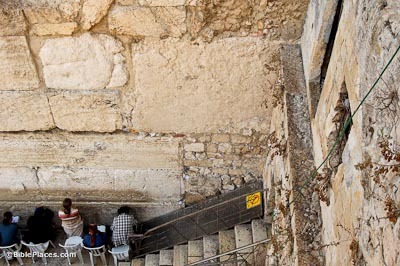 The Kotel (Personal Page, Jabberwocky.com) Showcases large photographs with personal commentary. Kotel (Personal Page) Features several nice black & white photographs, artistically presenting unusual views of the wall. Major General Sir Charles William Wilson (Palestine Exploration Fund) A biographical sketch of a British military man who did extensive archaeological work in Jerusalem, including the identification of the Herodian arch, located in the men’s prayer section, now named for him.